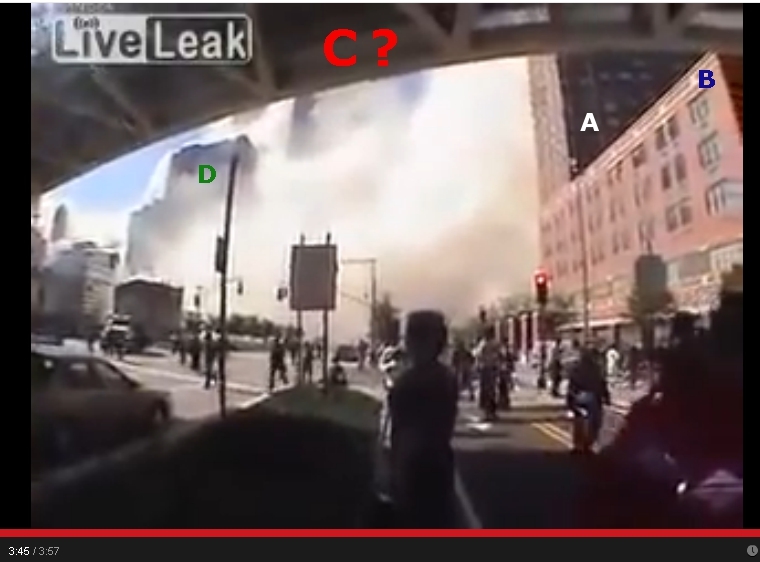 Strange 'coincidence' too that it is the same tower/elevation that was 'hit' first according to what we were shown on TV, let alone the same floors. This particular clip containing those KING KONG MEN "about to jump to their death" is to be found all over the place - in different videos with different soundtracks. 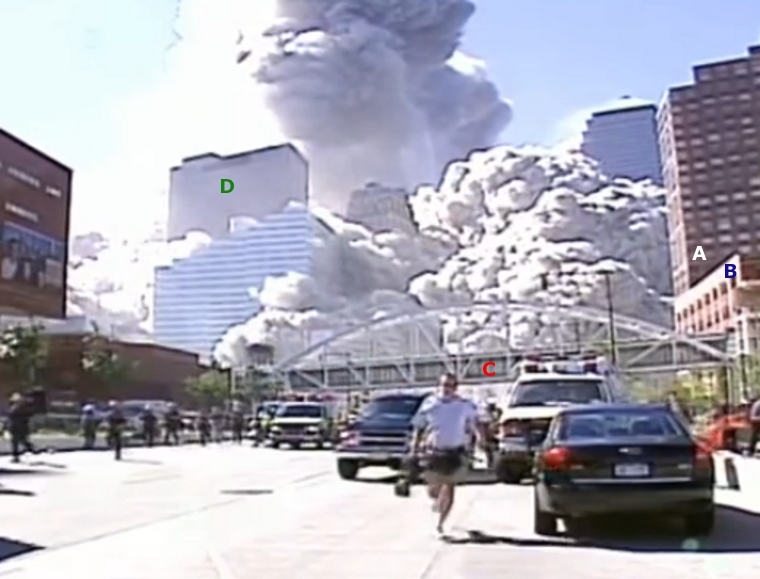 As I point out in my previous post above, this very same clip was also shown on ABC TV at around 1pm on September 11, 2001 (while Rudy Giuliani was being interviewed). 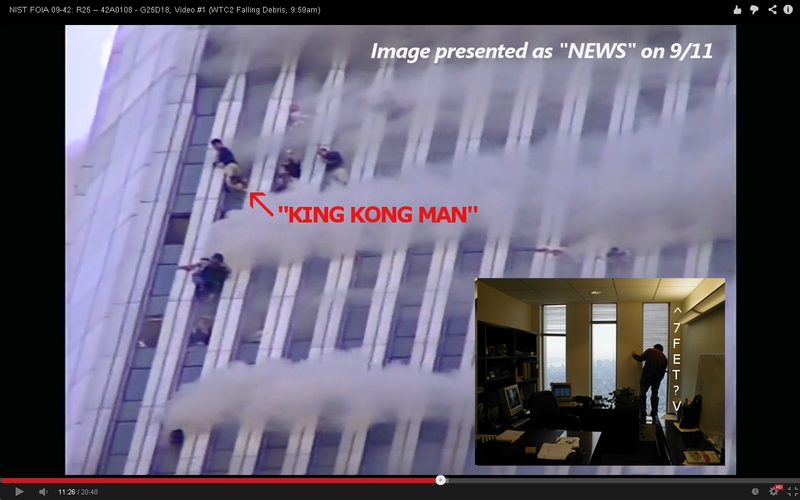 The KING KONG MAN clip is one of countless clues - yet a particularly solid / incontrovertible one - showing that the entire 9/11 imagery (and not only the "plane crash" imagery) was prefabricated. In other words, what was aired on TV that day was nothing but a "Hollywood production" presented as "news". We call it "Blue Boxing" at our studio, but that's only because the grid texture we use is blue. Basically its just blocking out a level/environment with primitives with a grey grid texture applied to it, and you end up getting a bunch of grey boxes around the place, thus the name. Its a quick way to prototype a level and get it into the game for play testing. You can quickly determine if the level is going to be fun, if the scale is right, will it be balanced well, that sort of thing. Its great for blocking out geometry to see what shapes will work really well. Think of it as a 3D sketch for an environment. 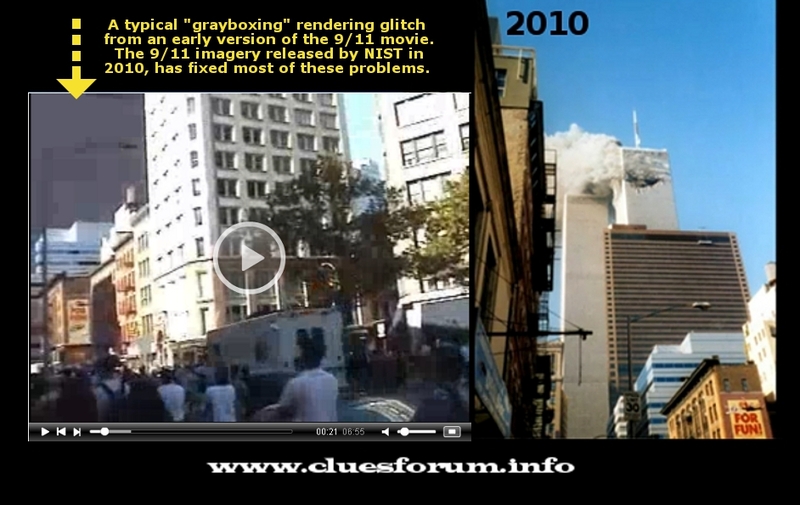 Of course, this is only ONE of many problems with the grotesque 9/11 movie - but one worth revisiting, nonetheless. Tom Brokaw 'getting nuked' by some divebombing pixels ! This is to encourage everyone to use my short, 2min25s "SOME BIRDS" video to introduce people to the concept of "total 9/11 fakery". Please diffuse it far and wide - through all the channels that you may have access to. Thanks ! Simon, there is a little typo of the word Length (Lenght) at 1:16 in the birds video. I love the Brokaw expression as he gets "Space Invaded" by crappy pixel effects! I was watching the movie The Secret Life of Walter Mitty with my son, and there's a scene where they are driving away from an erupting volcano. We laughed and suspected that it was a not so subtle reference to all "the people" running away from the falling/collapsing towers. So I did a simple "google image search" for "people running from the World Trade Center collapse", and I came across this image, which I'm not sure I've seen on CF. If it has already been posted elsewhere then please accept my apologies. In any event, it absolutely hilarious. I hardly know where to begin with all the problems in the above image. It's astounding really. That shirt. That head. And the partially invisible Police truck. 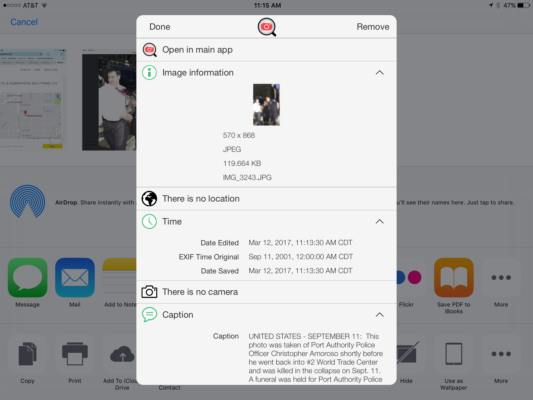 So for giggles I checked for any metadata and this is what came up. So the original is at 12:00 AM (CDT)/1:00 AM (EST) on 9/11/01? Not that a more "accurate" time given would make the image any less absurd. One would think the utterly ridiculous and sloppy imagery would have been cleaned up a bit more by now. Sure they have at least tried with "better resolution videos", but this stuff is just crap. Fun to pick through though. ADMIN NOTICE (simon) : Skywalker, please stop posting / embedding videos without a single word of commentary on your part - that's quite pointless. Thanks. As Simon has already warned you, SkyWalker007, please use our forum as a forum to discuss ideas; not merely as your personal channel. Thank you.